"Triple Name Rings Silver, Personalized Mother's Ring for Four Children"
The triple name ring makes a great gift for the mother of four. You can double up the names on one of the bands. Or double up the names on two bands and put a word or phrase on the third band. 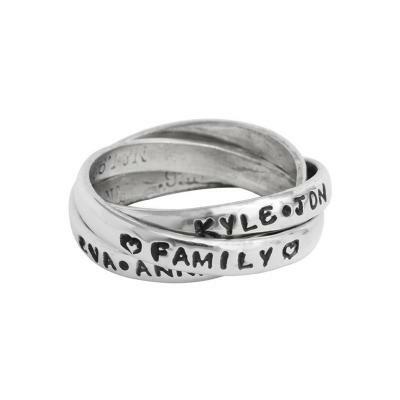 The popular triple name ring is great for the mother of four. This type ring only goes up to a maximum of three bands - adding more would make the ring too bulky and uncomfortable. So use your imagination when personalizing your mother's ring! You can double up two names on one of the bands. Or double up the names on two of the bands and a put word or phrase on the third band such as "family", "love", "my crew"...be creative.